Call Trucks Only Internet Department 602-354-7623 for all the specs and to schedule your test drive! Did you know that there is an entire subculture of truck owners that spend nearly every weekend out exploring their environment? Do you want to be part of the Raptor Club, getting muddy, hitting the dunes, and looking HOT while doing so? 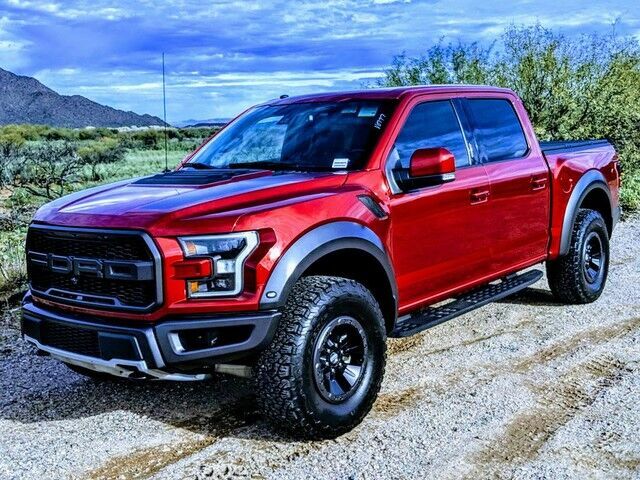 This 2017, Carfax One Owner, Ford Raptor is loaded with features, and sports the beautiful Ruby Red Metallic exterior, black leather interior, premium sound, and so much more! First Oil Change on us, with every vehicle purchase. Ask if this vehicle qualifies for our Lifetime Engine Warranty! *Diesel and high performance engines are not applicable. Trucks Only has been in business for over 40 years. Our customers have helped us to earn and maintain the A+ rating with the Better Business Bureau and we have been honored to achieve the Customer Satisfaction Award with DealerRater 3 years in a row! Call Trucks Only Internet Department 602-354-7623 for all the specs and to schedule your test drive! Shipping is available across the United States! Please let us know how we can help you find the right solution for your needs! Did you know that there is an entire subculture of truck owners that spend nearly every weekend out exploring their environment? Do you want to be part of the Raptor Club, getting muddy, hitting the dunes, and looking HOT while doing so? This 2017, Carfax One Owner, Ford Raptor is loaded with features, and sports the beautiful Ruby Red Metallic exterior, blck leather interior, premium sound, and so much more! Call Trucks Only Internet Department 602-354-7623 for all the specs and to schedule your test drive! 2018 GMC Sierra 2500HD Duramax Diesel in excellent condition. Carfax One Owner, SLT trim. The 2018 GMC Sierra 2500HD is a highly capable heavy-duty truck with lots of extras. It can tow over 14,000 pounds, seat six and it's wrapped up in an attractive package. If you need more capability than the Sierra 1500 but don't want the added expense or size of the 3500, the 2500 is the obvious choice. First Oil Change on us, with every vehicle purchase. Ask if this vehicle qualifies for our Lifetime Engine Warranty! *Diesel and high performance engines are not applicable. Trucks Only has been in business for over 40 years. Our customers have helped us to earn and maintain the A+ rating with the Better Business Bureau and we have been honored to achieve the Customer Satisfaction Award with DealerRater 3 years in a row! Call Trucks Only Internet Department 602-354-7623 for all the specs and to schedule your test drive! Shipping is available across the United States! Please let us know how we can help you find the right solution for your needs! Call Trucks Only Internet Department 602-354-7623 for all the specs and to schedule your test drive! Are you the kind of person who must must must have the best? Do you NEED those refinements, not just WANT them? The Epitome of luxury, Cadillac Escalade, is for you. This gorgeous 4x4 is equipped with Navigation, leather, DVD entertainment, and more! First Oil Change on us, with every vehicle purchase. Ask if this vehicle qualifies for our Lifetime Engine Warranty! *Diesel and high performance engines are not applicable. Trucks Only has been in business for over 40 years. Our customers have helped us to earn and maintain the A+ rating with the Better Business Bureau and we have been honored to achieve the Customer Satisfaction Award with DealerRater 3 years in a row! Call Trucks Only Internet Department 602-354-7623 for all the specs and to schedule your test drive! Shipping is available across the United States! Please let us know how we can help you find the right solution for your needs! Call Trucks Only Internet Department 602-354-7623 for all the specs and to schedule your test drive! Duramax! Trucks Only Off-Road style! GIMA premium wheels, off-road tires, Magnum side steps. Carfax One Owner Duramax with towing package, LT trim. First Oil Change on us, with every vehicle purchase. Ask if this vehicle qualifies for our Lifetime Engine Warranty! *Diesel and high performance engines are not applicable. Trucks Only has been in business for over 40 years. Our customers have helped us to earn and maintain the A+ rating with the Better Business Bureau and we have been honored to achieve the Customer Satisfaction Award with DealerRater 3 years in a row! Call Trucks Only Internet Department 602-354-7623 for all the specs and to schedule your test drive! Shipping is available across the United States! Please let us know how we can help you find the right solution for your needs! Call Trucks Only Internet Department 602-354-7623 for all the specs and to schedule your test drive! Want a truck that is large enough to hold the family, comfortable enough for the longest journey, and strong enough to handle the biggest haul? This gorgeous 2012 Mega Cab Cummins Diesel Laramie has only 36500 miles, is a Carfax One Owner, has been meticulously maintained, and features leather, barn door style camper shell. This 4WD-equipped vehicle handles any condition on- or off-road with the sure footedness of a mountain goat. With unequaled traction and stability, you'll drive with confidence in any weather with this Saddle Brown Pearl 2012 4WD Ram 2500 Laramie. Marked by excellent quality and features with unmistakable refined leather interior that added value and class to the Ram 2500. First Oil Change on us, with every vehicle purchase! Ask if this vehicle qualifies for our Lifetime Engine Warranty! *Diesel and high performance engines are not applicable. Trucks Only has been in business for over 40 years. Our customers have helped us to earn and maintain the A+ rating with the Better Business Bureau and we have been honored to achieve the Customer Satisfaction Award with DealerRater 3 years in a row! Call Trucks Only Internet Department 602-354-7623 for all the specs and to schedule your test drive! Carfax One Owner Cummins Diesel crew cab 4x4 in great condition with low miles. First Oil Change on us, with every vehicle purchase. Ask if this vehicle qualifies for our Lifetime Engine Warranty! *Diesel and high performance engines are not applicable. Trucks Only has been in business for over 40 years. Our customers have helped us to earn and maintain the A+ rating with the Better Business Bureau and we have been honored to achieve the Customer Satisfaction Award with DealerRater 3 years in a row! Call Trucks Only Internet Department 602-354-7623 for all the specs and to schedule your test drive! Shipping is available across the United States! Please let us know how we can help you find the right solution for your needs! Call Trucks Only Internet Department 602-354-7623 for all the specs and to schedule your test drive! Carfax One Owner Cummins Diesel with premium Raceline wheels, off-road tires, towing package, bedliner, and tonneau cover. First Oil Change on us, with every vehicle purchase. Ask if this vehicle qualifies for our Lifetime Engine Warranty! *Diesel and high performance engines are not applicable. Trucks Only has been in business for over 40 years. Our customers have helped us to earn and maintain the A+ rating with the Better Business Bureau and we have been honored to achieve the Customer Satisfaction Award with DealerRater 3 years in a row! Call Trucks Only Internet Department 602-354-7623 for all the specs and to schedule your test drive! Shipping is available across the United States! Please let us know how we can help you find the right solution for your needs! Carfax One Owner Cummins Diesel with premium Raceline wheels, off-road tires, towing package, bedliner, and tonneau cover. Located at 837 W Apache Trail in Apache Junction. Call Doris 480-671-5600 for complete details. Ram Cummins Diesel crew cab 2500 with bedliner, towing package, SLT trim. First Oil Change on us, with every vehicle purchase! Ask if this vehicle qualifies for our Lifetime Engine Warranty! *Diesel and high performance engines are not applicable. Trucks Only has been in business for over 40 years. Our customers have helped us to earn and maintain the A+ rating with the Better Business Bureau and we have been honored to achieve the Customer Satisfaction Award with DealerRater 3 years in a row! Call Doris at 480-671-5600 for complete listing details! Located at 837 W Apache Trail in Apache Junction. Call Doris 480-671-5600 for complete details. 2015 GMC Sierra 4x4 SLT with leather, premium audio, towing package, bed liner, tonneau cover. First Oil Change on us, with every vehicle purchase. Ask if this vehicle qualifies for our Lifetime Engine Warranty! *Diesel and high performance engines are not applicable. Trucks Only has been in business for over 40 years. Our customers have helped us to earn and maintain the A+ rating with the Better Business Bureau and we have been honored to achieve the Customer Satisfaction Award with DealerRater 3 years in a row! Shipping is available across the United States! Please let us know how we can help you find the right solution for your needs! Call Trucks Only Internet Department 602-354-7623 for all the specs and to schedule your test drive! Lifted Chevy Silverado Duramax Diesel! Trucks Only Off-Road GOLD package Silverado features Moto Metal Premium wheels, Dirt Commander M/T's, running boards, and a 6" Rough Country lift! Together with our State-of-the-Art Service and Accessories Center, we are very proud to offer an EXCLUSIVE Lifetime Lift Warranty on most of our lifted inventory! Is this vehicle not EVERYTHING you want? Ask your representative what accessories and upgrades might be available! First Oil Change on us, with every vehicle purchase. Ask if this vehicle qualifies for our Lifetime Engine Warranty! *Diesel and high performance engines are not applicable. Trucks Only has been in business for over 40 years. Our customers have helped us to earn and maintain the A+ rating with the Better Business Bureau and we have been honored to achieve the Customer Satisfaction Award with DealerRater 3 years in a row! Call Trucks Only Internet Department 602-354-7623 for all the specs and to schedule your test drive! Shipping is available across the United States! Please let us know how we can help you find the right solution for your needs! Call Trucks Only Internet Department 602-354-7623 for all the specs and to schedule your test drive! Mega Cab Laramie in great condition with DVD entertainment, moon roof, leather, bedliner, and towing capabilities. First Oil Change on us, with every vehicle purchase. Ask if this vehicle qualifies for our Lifetime Engine Warranty! *Diesel and high performance engines are not applicable. Trucks Only has been in business for over 40 years. Our customers have helped us to earn and maintain the A+ rating with the Better Business Bureau and we have been honored to achieve the Customer Satisfaction Award with DealerRater 3 years in a row! Call Trucks Only Internet Department 602-354-7623 for all the specs and to schedule your test drive! Shipping is available across the United States! Please let us know how we can help you find the right solution for your needs! Located at 837 W Apache Trail in Apache Junction. Call Doris 480-671-5600 for complete details. 2016 Ram Cummins Laramie in good condition with leather, premium sound, bedliner, and towing package. First Oil Change on us, with every vehicle purchase! Ask if this vehicle qualifies for our Lifetime Engine Warranty! *Diesel and high performance engines are not applicable. Trucks Only has been in business for over 40 years. Our customers have helped us to earn and maintain the A+ rating with the Better Business Bureau and we have been honored to achieve the Customer Satisfaction Award with DealerRater 3 years in a row! Call Doris at 480-671-5600 for complete listing details! Beautiful Mega Cab Ram Cummins 3500 in excellent condition with 90k, leather, premium sound, bedliner. First Oil Change on us, with every vehicle purchase. Ask if this vehicle qualifies for our Lifetime Engine Warranty! *Diesel and high performance engines are not applicable. Trucks Only has been in business for over 40 years. Our customers have helped us to earn and maintain the A+ rating with the Better Business Bureau and we have been honored to achieve the Customer Satisfaction Award with DealerRater 3 years in a row! Call Trucks Only Internet Department 602-354-7623 for all the specs and to schedule your test drive! Shipping is available across the United States! Please let us know how we can help you find the right solution for your needs! Stunning Ruby Red Lariat SuperDuty dual rear wheel in excellent condition. Features include leather, MyFord Touch with premium sound package, navigation, voice controls. Enjoy an extra level of calm when purchasing this Ford Super Duty F-350 DRW Lariat, it's a CARFAX One-Owner. The CARFAX report shows everything you need to know to confidently make your pre-owned purchase. Quality and prestige abound with this Ford Super Duty F-350 DRW. First Oil Change on us, with every vehicle purchase. Ask if this vehicle qualifies for our Lifetime Engine Warranty! *Diesel and high performance engines are not applicable. Trucks Only has been in business for over 40 years. Our customers have helped us to earn and maintain the A+ rating with the Better Business Bureau and we have been honored to achieve the Customer Satisfaction Award with DealerRater 3 years in a row! Shipping is available across the United States! Please let us know how we can help you find the right solution for your needs! Call Trucks Only Internet Department 602-354-7623 for all the specs and to schedule your test drive! Solid Duramax Diesel crew cab with bedliner, towing package, SLE trim package. Together with our State-of-the-Art Service and Accessories Center, we are very proud to offer an EXCLUSIVE Lifetime Lift Warranty on most of our lifted inventory! Is this vehicle not EVERYTHING you want? Ask your representative what accessories and upgrades might be available! First Oil Change on us, with every vehicle purchase. Ask if this vehicle qualifies for our Lifetime Engine Warranty! *Diesel and high performance engines are not applicable. Trucks Only has been in business for over 40 years. Our customers have helped us to earn and maintain the A+ rating with the Better Business Bureau and we have been honored to achieve the Customer Satisfaction Award with DealerRater 3 years in a row! Shipping is available across the United States! Please let us know how we can help you find the right solution for your needs! Call Trucks Only Internet Department 602-354-7623 for all the specs and to schedule your test drive! Gorgeous 4x4 GMC Yukon XL with quad seating, third row, premium sound, towing package. First Oil Change on us, with every vehicle purchase. Ask if this vehicle qualifies for our Lifetime Engine Warranty! *Diesel and high performance engines are not applicable. Trucks Only has been in business for over 40 years. Our customers have helped us to earn and maintain the A+ rating with the Better Business Bureau and we have been honored to achieve the Customer Satisfaction Award with DealerRater 3 years in a row! Call Trucks Only Internet Department 602-354-7623 for all the specs and to schedule your test drive! Shipping is available across the United States! Please let us know how we can help you find the right solution for your needs! GMC Yukon XL withe leather, quad seating, towing package, Oversized premium wheels, and performance tires.